Host Kalyn James visits 2 new Melissa South Florida stores and finds herself in shoe heaven! i wonder if these get slippery in the summer…? 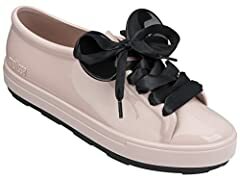 I would think the rubber would make you feet sweat and that any moisture from rain would make your feet slide around in the shoe.